This name uses Spanish naming customs: the first or paternal family name is Brühl and the second or maternal family name is González. 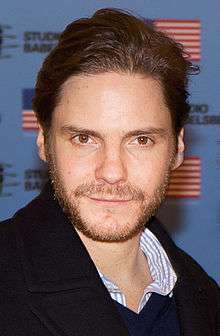 Daniel César Martín Brühl González (German pronunciation: [bʁyːl]; born 16 June 1978) is a German actor. He began his work at a young age in a German soap opera called Forbidden Love in 1995. In 2003, his starring role in the German film Good Bye, Lenin! received wider recognition and critical acclaim which garnered him the European Film Award for Best Actor and the German Film Award for Best Actor. Brühl has worked in both European and American productions in several different languages. He was introduced to mainstream U.S. audiences with his breakout role of Fredrick Zoller, a German war hero in Quentin Tarantino's Inglourious Basterds, and appeared in films such as The Bourne Ultimatum, The Fifth Estate and A Most Wanted Man. Brühl received widespread critical acclaim and further recognition for his portrayal of former Formula 1 driver Niki Lauda in the Ron Howard biographical film Rush. In 2016, Brühl made his Marvel Cinematic Universe debut in Captain America: Civil War, portraying Helmut Zemo. Brühl was born in Barcelona, Spain. His father was the German-Brazilian TV director Hanno Brühl, who was born in São Paulo, Brazil. His Spanish mother was a teacher. He also has a brother and a sister, Oliver and Miriam. Shortly after his birth, his family moved to Cologne, Germany, where he grew up and attended the Dreikönigsgymnasium. Brought up in a fully multilingual home, he speaks fluent German, Catalan, English, Spanish and French - and understands Portuguese. In 2006, Brühl separated from his long-time girlfriend and later fiancée, actress Jessica Schwarz, whom he had met on the set of the 2001 film Nichts bereuen. Since 2010, he has been in a relationship with psychologist Felicitas Rombold. In May 2016, it was confirmed that the couple is expecting their first child. In May 2009 Brühl decided to become active in a different field of filmmaking by launching the production company Fouronfilm together with Film1. Brühl starred in the 2010 British-Russian production In Transit where he played a young Nazi soldier opposite John Malkovich. He also co-starred with Clive Owen in the 2011 horror thriller Intruders, which was directed by Juan Carlos Fresnadillo. In 2015, he starred in Colonia, a thriller by Academy Award-winner Florian Gallenberger. The film was shot October to December 2014 in South America, Germany and Luxembourg. His co-stars are Emma Watson and Michael Nyqvist, and the film was produced by Academy Award-nominee Benjamin Herrmann. Brühl then played Helmut Zemo in Captain America: Civil War, released in spring 2016. Bambi Awards (2003) – Best Ensemble, shared with Katrin Sass and Florian Lukas for Good Bye Lenin! European Film Awards (2003) – Best Actor (Critics Award) for Good Bye Lenin! European Film Awards (2003) – Best Actor (Audience Award) for Good Bye Lenin! German Film Awards (2003) – Best Actor (Film Award in Gold) for Good Bye Lenin! German Film Awards (2003) – Best Actor (Audience Award) for Good Bye Lenin! ↑ Goitia, Fernando. "Tenemos Angela Merkel para rato" (in Spanish). XL Semanal. Retrieved 20 October 2013. ↑ Filmportal.de (2012-04-05). "Daniel Brühl". Filmportal.de. Archived from the original on 2012-04-05. Retrieved 2012-04-05. ↑ Kahlschlag: das Drehbuch zum Film - Dieter Bongartz - Google Books. Retrieved 2014-05-29 – via Google Books. ↑ Meza, Ed (2009-05-16). "Daniel Bruehl launches fouronfilm". Variety. Retrieved 2009-07-14. ↑ "Clive Owen to Star in Juan Carlos Fresnadillo's Intruders". DreadCentral. ↑ "Emma Watson, Daniel Bruhl to Star in Thriller 'Colonia'". Variety. Retrieved 2015-01-11. ↑ "Daniel Bruhl Cast in Marvel's Captain America: Civil War". Marvel. November 15, 2014. ↑ fleming, Jr, Mike (November 14, 2014). "Daniel Bruhl To Play Villain In 'Captain America: Civil War'". Deadline. Wikimedia Commons has media related to Daniel Brühl.